Every year raging forest fires ravage thousands of acres in our western states. There are terrible accounts of harrowing rescues and devastating, widespread destruction. Heart broken, residents and reporters stand where luscious woodlands, loving homes and busy lives flourished. Now blackened wastelands, smoking debris, shattered lives and broken dreams seem all that remains. A few days ago while speaking with one of our preschool teachers we talked about a period of time in her life when, during a time of great loss, she was deeply saddened by grief. Surprisingly, she smiled as she spoke of how life was even better than before. We agreed that in many ways her experience was like that of a forest fire. At first her life was characterized by floods of tears and a broken heart. During that time it seemed like her life was over and she would never find happiness again. In a similar way after fire has brought destruction it seems life in the woods is over. But we know this is not true. After some time has passed, almost without notice, life begins to return to the forest. First rains come and begin to wash the ash away. Then comes the warming rays of the sun bursting through where once the old growth canopy blocked it. 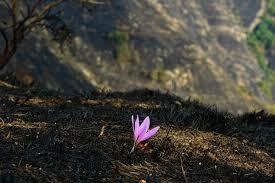 Fed by the sun’s power, enriched by nutrients in those ashes, new life begins where before it had no chance. Without the competition of weeds, towering trees and hardened paths new life thrives! In fact biologists tell us these fires are essential to healthy forests. When loss leaves in its wake empty days, broken hearts and rivers of tears it also leaves opportunity for something new to flourish where before it never had a chance. Now, several years past the ‘fire’ that ravaged her life that teacher agreed that good things had come to her which, without her loss, would have never had a chance.